AT&T will offer Mobile Share Plan users free access to Apple’s FaceTime service at no extra charge, but will not extend that to other users on its service, reports MacRumors. Whether AT&T would charge for the feature had become a topic for discussion since Apple revealed that iOS 6 users would be able to use it over cellular networks as well as WiFi. The new sharing plans were announced last month and will arrive on August 23rd. The plans won’t automatically save money for most users. If you have an unlimited talk and text plan then you might find a way to end up with a cheaper bill if you juggle them. If you’re not a heavy SMS or talk user, they’re likely to raise your bill, rather than lower it. Offering FaceTime over 3G and 4G to those users only is kind of sucky, frankly. Sprint has already said it won’t charge for the feature and Verizon has yet to clarify. 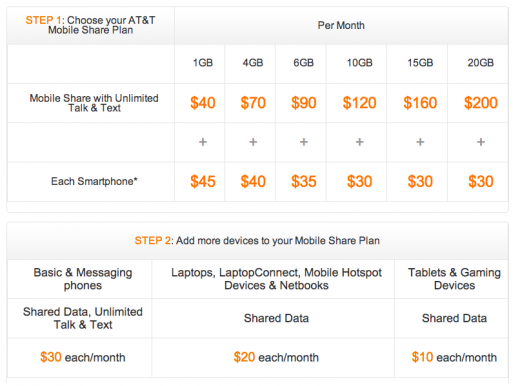 Verizon also recently announced shared data plans.